This is a very handy add-on for support teams. I have emailed questions twice now and have found the vendor's support to be outstanding. Create templates specific to your projects. Increase ease of use of templates by limiting their usage using three scopes: personal, project or global. Start writing comments from a predefined template which can be used with just one click. 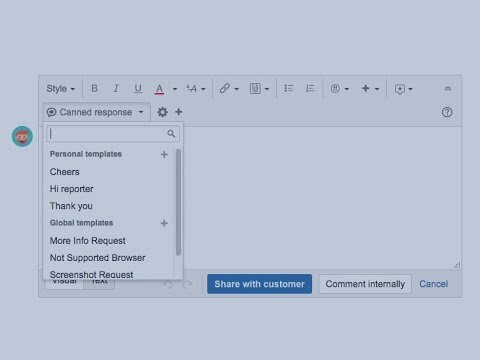 Canned Responses allow you to use dynamic macros to generate contextual templates based on commented issue data. You can check a list of supported macros here. Learn more about Spartez' products. Read how to install, configure and get the most out of our agile tools for Jira. Print for standups, planning and backlog ordering. Create custom templates for your issues. Automatically upload your pinboard status to Jira. Asset management solution designed to help with the visibility and tracking of your inventory. Need to improve and speed up your responses to user comments? Canned Responses Pro for Jira to the rescue!